Its gonna be along entry, hope you guys don't mind. Do you really trust about instinct? Sincerely, I don't admit myself as someone who can smell somethings not ok.*six sense people* But every times it happened, then only I realized, I knew about this. Its happened when I felt unsecured, u know that something wrong somewhere, *or even kalau ada org tak suka kita ke ape pun, boeh detect* This is not so important. How about mother-instinct? This part, I guess semua mak-mak mmg ada. Semulajadi wujud dalam diri seseorang yg bergelar ibu. Uneasy feeling that your kids are not happy, not ok or not so secure. But the problem is, I don't know how to translate them into degree of criticalness. Should I worry, or it just a normal feeling. Or things that I should not even think about. Stress ok! So happened, as you know that both of my kids just started new pre-school and playhouse. *yes, sorrylah tak habis lagik pasal anak pergi sekolah kan* Telling u the truth, jiwa ni memang tak tenang ever since day 1. It too smooth until I got nothing to be doubt. The first 2 days, Ryan is crying, sekejap je. Following weeks, pergi sekolah balik sekolah, happy and relax aje. But there is somethings that I wanted to know. So normally lah kan, after school Adam akan jadik mangsa, mommy kept on asking this and that. Even worst, Adam is not so talkative boy. You ask 1 question, he will answer 1 time. Or kalau dia duduk main ipad, sorry lah mmg dia tak layan. I need to know what they are doing at school, to be exact, are they eating well, sleep well since my kids are under full day program. I don't expect much as this still the first few weeks. Everyone is taking time to suit with each other, to suit with new environment. In fact, time ni diorang mmg tak belajar lagik. Still under ground rule session. So, the only way I can know about them is through their teacher aka aunties. But still, everytime we picked the kids in the evening, its too congested with all elementary school student plus, the aunties has to go up and bring the kids down, I don't have time to ask. *problem bila tempat sempit or shop lot* Some of the Aunties yg handle my kids, they not working 7-7, so when I fetched my kids at 6pm, they already went back. So I have no chance to ask. This week, the feeling of unsecured getting stronger. Specially for Ryan. Keinginan nak tahu condition Ryan sgt lah kuat. Is he doing well at school?Sleep well, eat well. Omg. If I managed to call the aunty pun, she will said he's ok. At one time I thot, maybe I ni terlampau risau. Dah tahu ok, tapi still tak puas. On time, rase macam nak suruh someone go and investigate. Stoopid of me! Allah tu Maha Mengetahui. He always has a better plan for all of us. Thank you Allah. Out of sudden, yesterday I received a comment msg which went to my mail box for approval. I knew her, I read her blog, but I dont think she's a regular reader of mine. She msg me to watsapp her no, and she also mention about Ryan. Allah sahaja yg tahu, I was shivering. Takut ok. Anything wrong? ?I dah pikir macam2 while waiting for her to reply mg msg. Ya Allah, the longest 10 min ever had. When she replied me, she informed me she used to be Adryan's aunty at this playschool. Msg tergantung because she busied with anything else that time, hanya Allah yg tahu macam nak tercabut jantung rasenya. He told Adryan selalu nangis kat school? ?Bukan nangis meraung2 macam orang tak nak pergi school. It just nangis merengek2 and always standing at sliding doors. After a while she knew that Ryan has brother in preschool, the reason dia selalu pergi intai kat sliding door tu. And she also mentioned Ryan cepat thirsty, the ebm that I brought maybe not enuff. I was waiting for her next msg, until I decided to call, but she's not free that time. After a while we managed to have along fruitful conversation through watsapp. I was happy, when I knew he's ok. Besides other cepat dahaga and asyik berdiri kat pintu, Aunty E *not the real name* convinced me that Ryan is a good boy. Maybe he just need time to suit with new friends and environment. We talked other things *sort of gossips* too. At least I knew what to expect. This is common things when u send your kids at daycare or nursery or kindy. *rase nye bila hntr universiti je pensyarah tak bergossip pasal mak bapak kan* I got 4 years experience, and InsyaAllah I know how to handle. How I wish Aunty E *with her super cute dotter* still there. I can watsapp or inform her every time urgent things come up. Unfortunately she only managed to be Aunty for that playschool for 2 days. She said, tho its so hard for her to leave the kids, *some of them already attached with her*, but she has reason doing so. I was so much appreciate for that 2 days she spent with him. In fact, the pictures she sent me, oooowhhh really make me happy. U really make my day darling! After a short conversation with Mr Hubby yesterday, we knew what to expect. Arini datang office perasaan berkecamuk tu dah hilang. What I did today, me and Mr Hubs decided to provided them a big breakfast every morning. Maybe sb dekat nursery lama, diorang selalu suap Ryan tak tentu masa, so ebm selalu tak habis. They even threw it. Sobs! Ever since that, I only brought 2 bottles of ebm around 10 oz. So maybe at this school, they strictly followed the timetable. 2 times milk time and breakfast at 10am. It can be only coco crunch at that time. Mana mahu si Ryan tu. So today I bawak more ebm. I think dlm 14- 15 oz, so he can have more than 5 oz at one time. After school, balik rumah cepat2 ready for dinner. In case kalau diorang lapar sgt kan. We still not receive the monthly menu, so we cannot plan and expect what they had everyday. Tanya Adam pun, macam2 tu je lah dia jawab. Pressure ok! 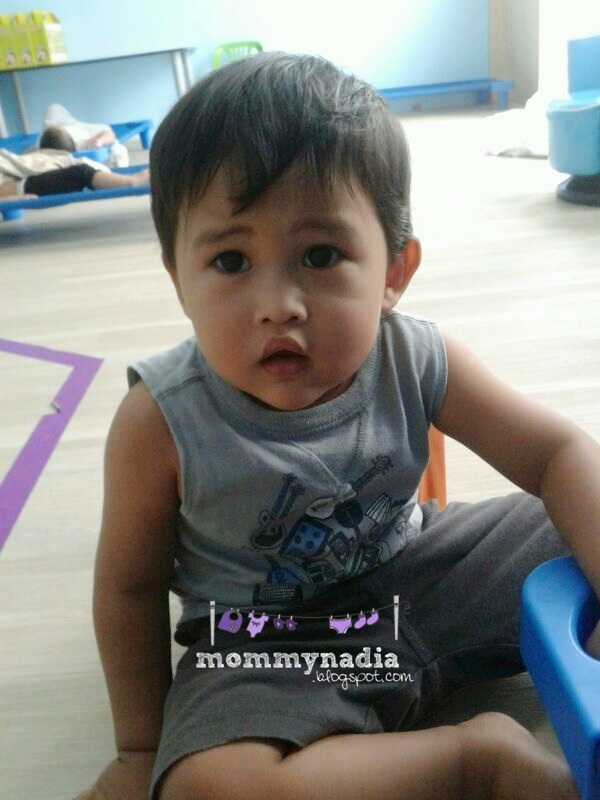 "Over grill ke Bie, hahahaha..ngantoklah tu.."
Btw, I leave u darls with some pictures of Ryan at playschool from Aunty E. I just plan to publish this picture for few hours only. Just to respect the privacy for both party! They provide this sort of bed frame, no pillow allowed.. But its ok, I dont train my kids to sleepwith pillow. Specially him tido yg macam tu kan..
Aunty E said, most of them Ryan is carrying his toilettries bag..hahaha..
Tu tengok dia tgk kat sape, Aunty's E cute lil dotter..hiks! untung you, ada jugak hamba Allah yg help you to know what went wrong with the instinct n all kan.
hopefully Ryan will be much better at his kindy from today onwards. ameen. sungguh murni usaha encik Charles bgn pg2 masak utk anak2.... my adam tu memang payah sungguh la makan. kat sekolah jrg mkn. kat rumah pun sama. kat umah ni atas effort kita la nak paksa suruh dia makan. selalu gastrik kan katanya. Suka tengok Ryan makan. Berselera. :) Pandai dia makan sendiri. Itulah Nad, kebetulan yg mmg tak sangka langsung. Now a lil bit happy dah, syukur! InsyaAllah,hopefully cepat dia sesuaikan diri. Itulah, kelebihan yg ada pada seorang ibukan, Subhanallah! Harapnye usaha murni tu kekal lama,boleh lah mommy solek2 lama sket. Iye Teh, perasaan yg mmg tak boleh nak explain, gusar seperti ada benda tak kena. Tak tahu lah mmg pesyen brahi rusing tak tentu hala ke. Suka toys diorang jugak, hopefully Ryan enjoy playing plus ngorat'ing awek2 cun jugak hiks! Ryan mmg suka sgt makan. Dah pandai makan, tapi kdg2 berterabur jugak. Tgk mood dia..
Hi Nadia..My son pun same preschool Dgn Adam n Ryan.I pun rasa mcm mana u rasa..nk sgt tau aktiviti kids kat skool..same ANak I xsuka nk bercerita n I pun meroyan sgt rasa.ANak I pun full day.hope can chit chat n share stories with u..how can I contact/whatsapp u?I xkenal parents lain. U can send email to nadya_1901@hotmail.com, i'll gv u my hp no nanti k..